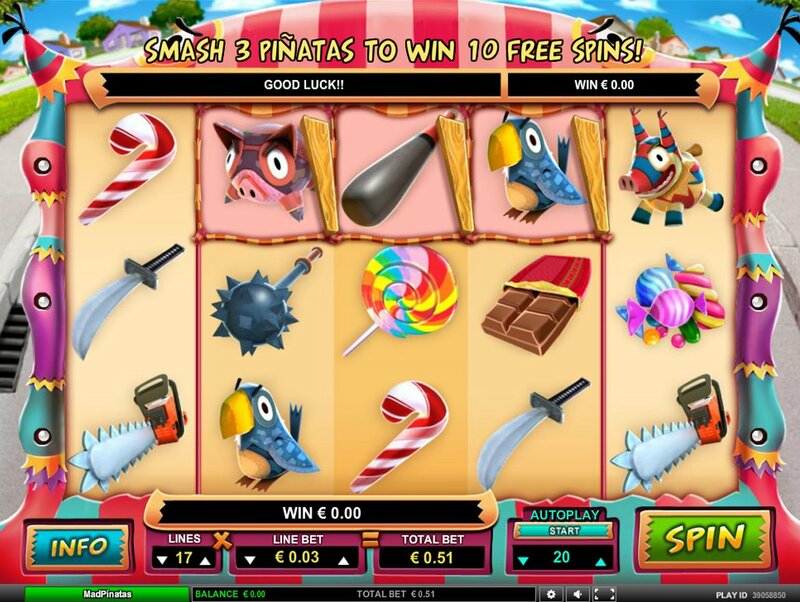 Fond of a mad online slots theme or three, online slot developer Leander Games take the ‘Mad’ straight into their game titles with their South American-themed game, Mad Pinatas. If you’re a fan of popular smartphone phenomenon, Angry Birds (and who isn’t?) you’ll get a kick out of this fun slot. From the intro music – which definitely has a touch of Angry Birds about it – you know you’re in cute and violent mode here. It is a theme that Leander Games seem to insert effectively into their slots. Previous releases including the nursery rhyme-inspired Little Pigs Strike Back is proof that the developer bonds cuddly and carnage together better than anyone. 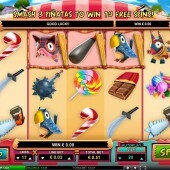 Mad Pinatas continues that approach that has proven so popular with slots players so far. The 5 reels in this 25 pay-line game are packed with pinatas – toy animals stuffed with sweets that children gleefully bash to bits at birthday parties in Central America – and a bewildering array of weapons, from chainsaws to baseball bats and scimitars. Completing the reels are some tasty-looking sweets and chocolate. The funny robot pinata dog acts as the game’s Wild, and it substitutes for all regular symbols other than the Bonus scatters. Five Wilds bags you a tasty 10,000 coin jackpot. There’s a nice little feature in Mad Pinatas which focuses on reels 2, 3 and 4. During the spins three boxes on those three central reels will have wooden sticks randomly assigned to them. You can then move those sticks to whichever squares you like. After a spin, if three pinatas land next to your sticks, you’ll trigger the game’s free spins round. 10 free spins will be yours, with extra spins up for grabs. Three Bonus symbols on reels 1, 3 and 5 will trigger the Pinata Time Bonus Round. Here, you’ll get to choose a weapon, pinata and multiplier. Choose the right weapon for the right pinata (and the right multiplier, of course) and you can bag yourself some tasty wins. Despite a rather tricky free spins round to trigger, this slot is certainly one for those looking for a bit of gambling action to make a change to the humdrum slots fare. The other bonus feature is ho-hum enough, but there’s certainly enough fun overall to be had. As for other similar slots fare, another Leander game – the Argentinian-themed Pampa Treasures – is a great alternative, while Pariplay’s crazy Latin-themed slot, Las Cucas Locas, surely beats both for sheer bonkersness.